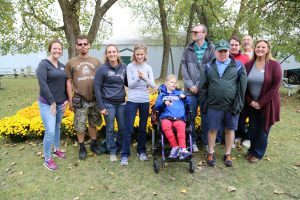 ​Palatine Park District ​ has started a new volunteer stewardship program with the PURSUIT Adult Day Program​. PURSUIT is a cooperative presented by Clearbrook​ and Northwest Special Recreation Association (NWSRA)​ that provides adult day services for individuals with disabilities who have transitioned out of high school. Members of the program have recently participated in stewardship projects at Palatine Stables​ where they assisted with the care of horses, facility maintenance, and other projects. After volunteers completed their duties, they were given the opportunity to interact with the horses. Palatine Park District Stables Manager Toni Bruns states, “Horses provide an excellent way for adults with developmental disabilities to receive the benefits of therapy in a less traditional way, which can be a lot of fun. Working with horses improves communication and social skills, while teaching responsibility and developing trust”. For more information about the volunteer stewardship program at Palatine Park District, contact Volunteer Coordinator Alissa DePue at 847.496.6212 or adepue@palatineparks.org.